Hi lovelies, I'm finally back with a new recipe; Panda Express Beijing Beef copycat adapted recipe from Rasa Malaysia. One of my favourite website. I'm new to this recipe but as what Bee says this recipe mostly served in Beijing restaurant and it's very easy to prepare it at home and I have to agreed that she's right. 1. Prepare the marinade in a bowl and mix well. Marinate the beef for 15 minutes. In separate bowl, mix all the Beijing sauce ingredients and set aside. 2. Place cornstarch in a bowl. 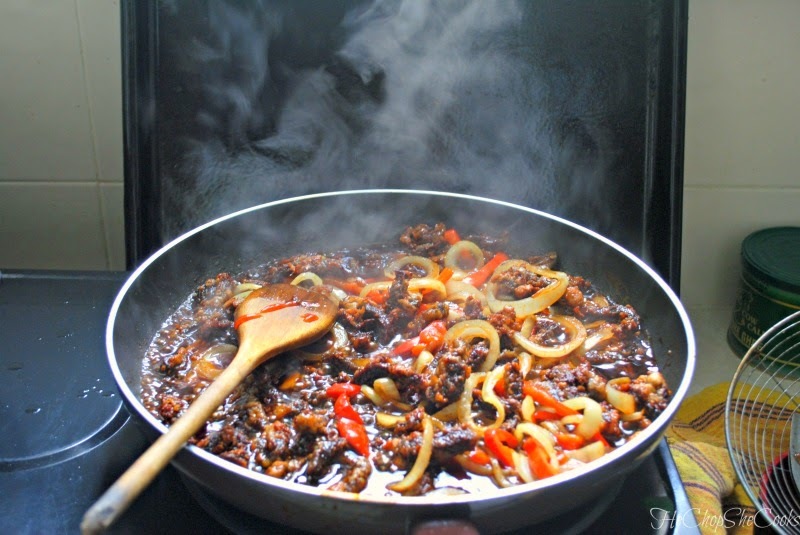 Toss marinate beef in cornstarch, coat well and set aside in the refrigerator. 3. Heat up enough oil over high heat. Coat beef slices with cornstarch again, making sure the beef slices are well coated. Shake off the excess cornstarch from beef slices. Prepare to deep-fry beef (in small batches:. Drop in the beef slices and deep fry for 1-2 mins or until light golden brown. Dish out, drained on paper towel and set aside. 4. In a wok, heat up the oil over high heat. Stir-fry the onion and bell pepper until fragrant and slightly charred, add in the garlic and continue to stir fry for 10 seconds. Remove from wok. 5. Heat up wok over medium-high heat, pour in the beijing sauce seasoning. Bring it to a simmer or until it thickens. You may adjust salt, soy sauce and water to taste. 6. Toss in the deep fried beef and stir fried onion, bell pepper and garlic. Stir well for 1 minute or until the beef is completely cooked and absorbed the sauce. Dish out and serve with hot steamed riced. I'd love to try this with chicken. Not a beef eater but the dish looks divine! Beijing sauce sounds wonderful!! Yum to the dish Shaz. Will replace with chicken or lamb. The beef dish looks appetizing! I am pretty sure it taste delicious too.